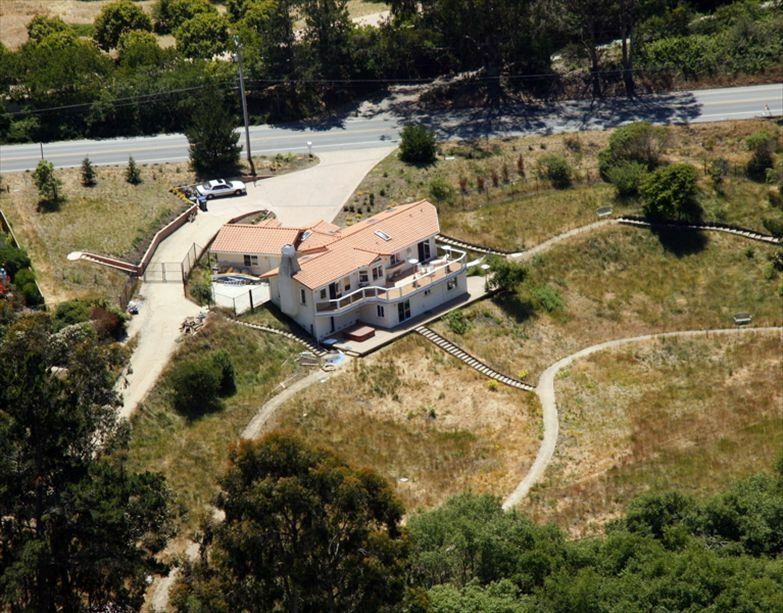 Manresa Meadows is a very special vacation rental on beautiful acreage just one block from Manresa State Beach. Meander down one of the wildflower lined paths through beautiful acres of meadow to the private eucalyptus-shaded picnic area, complete with firepit, teak picnic tables and chairs. Owls and a variety of interesting birds are frequently seen in the trees surrounding this part of the estate. Follow the path to high ground for a spectacular view of Monterey Bay. Tranquil views of meadow and farmland from the hot tub, master bedroom, and main deck. Expansive upper and lower decks, indoor and outdoor dining, gas BBQ, hot tub, wide-screen TV and comfortable great room design make Manresa Meadows a superior vacation home. Pet-friendly Manresa Meadows offers activities for the whole family. Fido will love sleeping in the two doghouses, running in the 400 sq. ft. concrete-surfaced dog run, and roving over the fully fenced two acres of meadowland. Manresa Meadows is on the Pacific Coast Bicycle Route, just south of La Selva Beach a short block’s walk from Manresa State Beach. Activities nearby include beachcombing on miles of white sandy shoreline, kayaking and wildlife viewing at Elkhorn Slough, hiking and mountain biking at Nisene Marks State Park, dining at Sanderling’s restaurant at Seascape Resort, and golfing at Seascape Golf Course in nearby Aptos. Monterey is 31 miles to the south, and Santa Cruz Beach Boardwalk is a short 14-mile drive. This was our home for 12 years. The floor plan is open and spacious. The 2-1/2 fenced acres provide a feeling of privacy and spacious natural beauty. We're close enough to enjoy all that Santa Cruz and Monterey have to offer — sightseeing, biking, surfing, hiking, beachcombing — and come home to tranquility and natural beauty. Unobstructed meadow and farmland views. Ocean view from high ground on the property. Over two acres of natural meadow habitat. Outdoor dining and charcoal grill on large upper deck accessible from living area and master bedroom. Lower deck with hot tub and seating accessible from both bedrooms on lower floor. Very tranquil 2,000 sq. ft. open floor plan • Private walking paths through 2 acres of meadow and high ground • Ocean view from high ground • Meadow and farmland views from all windows and decks • Private woodland picnic area with picnic tables, firepit, and lounge chairs • TV in great room and all bedrooms • 2 acres fenced for dogs • 400 sq. ft. separately fenced dog run with 2 dog houses. We enjoyed our stay here. The house is extremely pet friendly with a great floor plan. The driveway is a little steep but if you have a regular vehicle it will fit in the garage nicely. (I had a full size pickup). The carpet is a little out dated but it's works well with the pet friendly home. The property is huge with lots of space to let dogs run free. Completely fenced in with a nice dog kennel connected to the back side of the garage. Hot tub is in great condition and was very relaxing during the clear nights near the ocean. On that note, you can hear the ocean from all three rooms which was very pleasant on the clear nights with the windows open. Bailey Property Management was great to work with and I will definitely use them for my future rentals. Very clean and nice house. We are planning to come back in the future. Perfect for the dogs! Couldn’t ask for better if you are traveling with your 4 legged kids! We stayed 8 days, the setting was perfect for dog owners and the house was adequate. The carpets are badly stained and outdated. The couch is nice to look at but so worn that you sink in and it is very uncomfortable. We actually brought in patio chairs so we didn’t have a back ache. The property management company is very thrifty, they only leave you with one roll of toilet paper for each bathroom and limited garbage bags. When on vacation going to the store for toilet paper is not something I’ve ever had to worry about. I understand that there are some people who may take extras home, however those of us who wouldn’t have to take a trip to the store. On a positive note, we enjoyed watching the owls early on an overcast morning....wish we had binoculars with us. It’s a nice safe place that is close to beaches and easy access to nearby towns. Even though the house is on a busy street, the park-like backyard felt serene and secluded. We really enjoyed our stay! We rented the beach house for four days and three nights to celebrate our daughters 40th birthday, and it did not disappoint. She loves the beach and the color of the soothing blue interior of the house was perfect. Inside on the main floor there is interesting architecture, wood floors, high ceilings and large windows that added to the appeal. We were two small families along with two medium sized dogs and it felt open and roomy. There are stairs inside to access the lower bedrooms and laundry area, as well as stairs outside on the property. If you have a physical disability however, getting around could be a challenge but we had no problems with them. The king size bed in the master bedroom upstairs was perfect for our 6’3” son-in-law. Everyone slept well. There was plenty of firewood provided; two well fenced in acres for our dogs to run about, a hot tub, outdoor rinsing showers,( with warm water) and fire pit on the lower part of the property, along with chairs to gather together on - a perfect area for making s’mores. In addition we enjoyed playing some of the old board games inside at night with a cozy fire going in the fireplace and listening to music. The house is a short walking distance to Manresa beach, which was also big plus!! We found a couple of beach chairs in the garage and took them to the beach along with our own. The house is maybe 20 minuets from Santa Cruz, so we also enjoyed a jaunt to the local S. Cruz flea market; the Beach Boardwalk, and enjoyed a slice at the downtown Pizza My Heart. We found getting to the house and back to the freeway easy enough. Picking up and dropping off the key was not a problem- about 5 minutes away. We did bring extra T.P and paper towels as recommended, but didn’t use either of them. However we did wash the two kitchen towels to use again. Everyone loved their stay at the “birthday beach house” and we all agreed that we’re going to be back. Looking forward to it! I brought up my family which included kids and dogs. We spent a week there. The house had everything. We walked down to the beach, we made big dinners and we made yummy s'mores. We really enjoyed our time there. from the morning coffee to the night time hot chocolate. The kids and I enjoyed every part of it. we would love to do this again. Thanks to the team at Baileys for all of the help and support. It was the perfect place for a family vacation. A few steps from Manresa State Beach. We loved the huge backyard with fire pit, hot tub and fenced area for our dogs. The 1/4 mile loop through the property was a bonus. A wonderful stay in a beautiful home.